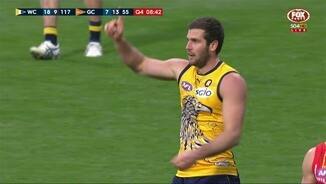 Eagles InterchangeJamie Cripps off due to an injury. Suns InterchangeMackenzie Willis off due to an injury. 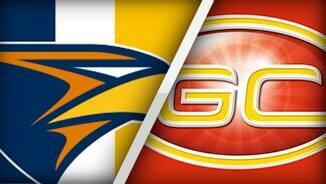 Welcome to Domain Stadium for the West Coast Eagles v Gold Coast Suns Round 10 clash. 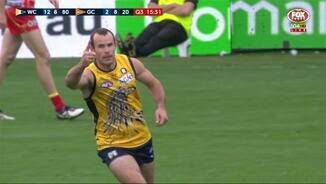 West Coast forward Josh Kennedy has booted five goals and Luke Shuey has starred through the midfield in the Eagles' 77-point win over Gold Coast at Domain Stadium. 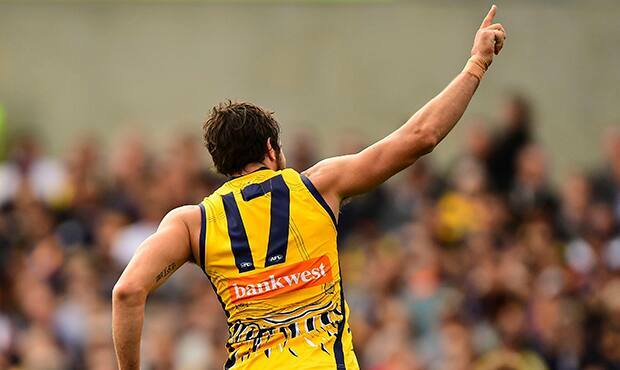 Kennedy had four goals to his name by half-time in Sunday's 20.12 (132) to 7.13 (55) romp, which lifts West Coast (7-3) to be equal on points with third-placed Geelong. The Suns have now lost seven AFL games on the trot, with their average losing margin during the past five weeks a worrying 87 points. And it doesn't get any easier for the injury-hit club, who take on one of the flag fancies, the Sydney Swans, at Metricon Stadium on Saturday. 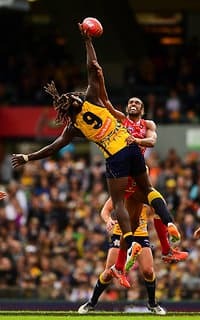 West Coast was never truly challenged at their home fortress after the ruck dominance of Nic Naitanui helped set the tone early. Kennedy feasted on the opportunities presented to him in the first half, while Shuey finished with 26 disposals and a goal. Eagles recruit Lewis Jetta tallied 17 disposals and three score assists in his first game back from a two-week stint in the WAFL. Kennedy's latest haul takes his season tally to 37, which is just three behind Coleman Medal leader Lance Franklin. 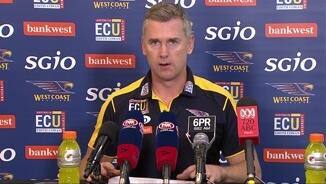 West Coast coach Adam Simpson said the match was a “bit of a grind”. “Teams turn up to win when they come here, so to start like we did and to maintain, for the most part, reasonable effort … we did what we had to do,” he said. Skipper Gary Ablett tried hard for the Suns, finishing with 32 disposals and eight clearances. 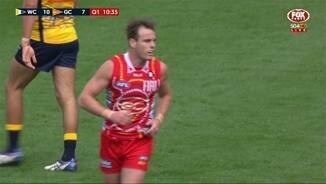 Gold Coast was dealt a blow before the match when Kade Kolodjashnij failed to make the flight west because of illness. And within a minute of the match beginning, star Suns midfielder Aaron Hall was left nursing a sore left shoulder after laying a heavy tackle. Although Hall was able to return to the field, he was still troubled by the injury, and he eventually made his way into the change rooms to receive further treatment. 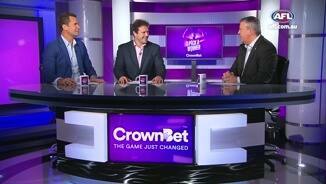 In the meantime, Kennedy and Jack Darling were proving to be a handful up forward. 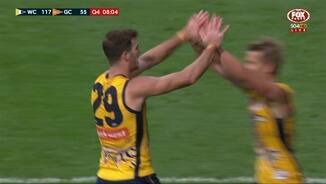 Kennedy had 4.1 by half-time, and Darling chipped in with two to give West Coast a 43-point lead at the long break. That buffer blew out to 71 points midway through the third quarter, but two quick goals to Tom Lynch gave Gold Coast something to cheer about. Tempers threatened to boil over late in the match following several heated contests, but the result was well and truly in the bag by that stage. 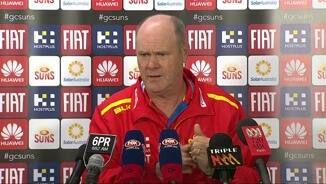 Gold Coast coach Rodney Eade said he was happy with the efforts of his players, but was relieved that the Suns' injury woes were set to ease with the return of up to nine players from injury over the next week. 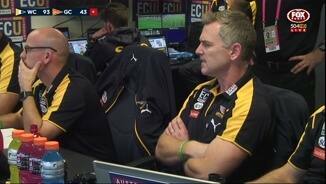 The younger players had made some “horrendous” errors, but many of them had been thrown in the deep end despite not being ready to play in the AFL. “We won the tackles, we won the pressure factor, we lost the contested possessions by 15, but that includes free kicks and we had 14 free kicks less, so really we lost the contested possessions by one,” he said. 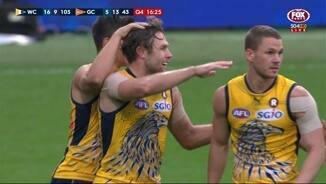 West Coast: Jamie Cripps copped a whack to his throat and left the field but played out the match with no dramas. The Eagles appeared to come away from the match unscathed. Gold Coast: Kade Kolodjashnij, who was replaced in the selected side by Mackenzie Willis, was suffering a recurrence of the abdominal pain he had in pre-season. 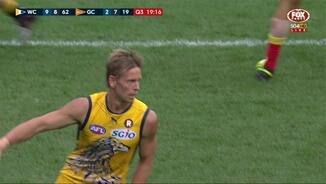 Aaron Hall appeared to injure his left shoulder during the first quarter, but recovered to play out the match. The Eagles will have their top-four credentials tested when they face the Western Bulldogs at Etihad Stadium on Sunday as they look to make it four-straight wins. The Suns will have up to nine players available for selection and they will host an in-form Sydney Swans at Metricon Stadium on Saturday night.